Tacos, titles, and talks – oh my! This year, Art of the Title was invited by Blake Kammerdiener, film submissions and production coordinator, and David Horridge, Design Awards organizer, to once again participate in the SXSW Title Design Awards. With the entire Art of the Title team in attendance for the first time, the program was a little different than in previous years. In addition to being on the Title Design Awards jury, we also gave a talk before the finalists screening. We kicked off the screening event with a talk and presentation by Managing Editor Lola Landekic and Senior Editor Will Perkins, who gave a brief history of title design in Hollywood, discussed the emergence of video game title design, and explored the possibilities of the medium. 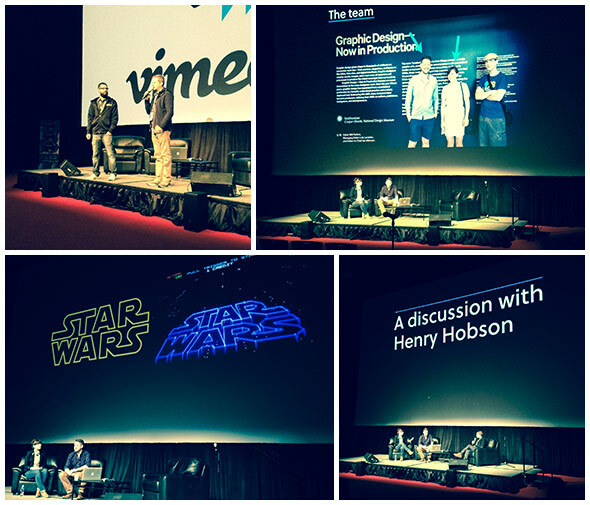 The talk capped off with an interview with filmmaker and title designer Henry Hobson, who helped create the nominated title sequence for video game The Last of Us and directed the upcoming feature film Maggie. Following the talk, the 18 Title Design Awards finalists were screened. Thereafter came the judging of the titles. The Title Design Awards jury included founder and editor-in-chief of Art of the Title Ian Albinson, PIC Agency co-founder and creative director Pamela Green, and filmmaker, copywriter, and graphic designer Yen Tan. As has become the tradition, the post-screening deliberation took place at the Hilton Bar, where Ian, Pamela, Yen, and David discussed the range of work submitted this year. Within an hour, the selections had been made. 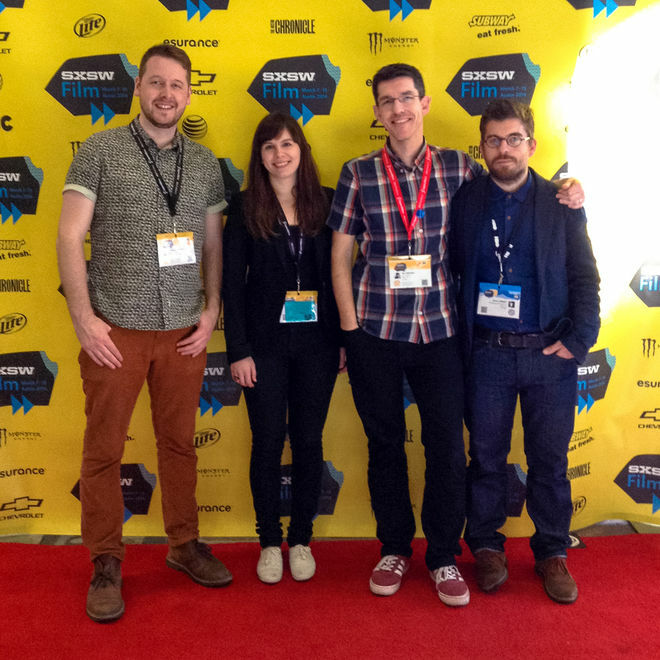 This year’s Title Design Awards Finalists screening was one of the best attended ever, with more than 200 people filling the Vimeo Theater at the Austin Convention Center. Thank you to everyone who attended this year’s event! After the event, we were happy to share some brews with Henry Hobson, his partner Manija Emran, Kevin Joelson, and the rest of the creative team at Sony Computer Entertainment America who'd all come to support their work on The Last of Us. We also had a chance to reconnect with Kurt Volk, Machete title designer and Troublemaker Studios art director, who once again served as a juror for the Excellence in Poster Design competition, as well as Gareth Edwards, director of the upcoming Godzilla film and title designer for 2009’s How We Built Britain, at the screening of the restored 1954 Godzilla (Gojira). 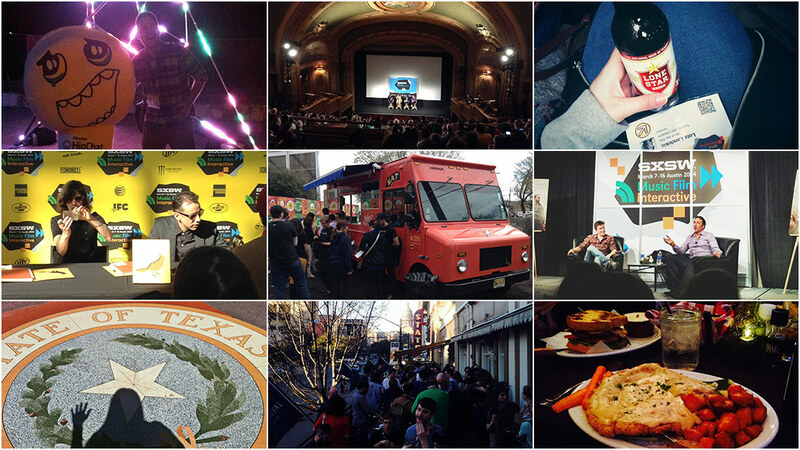 On Tuesday evening the winners of the Title Design Awards were announced at the SXSW Film Awards. This year's winner of the 2014 SXSW Excellence in Title Design Award was given to Patrick Clair/Antibody/Elastic's main title work for the HBO series True Detective. The jurors unanimously felt that the sequence set an evocative tone with arresting imagery, was technically impressive, and that the compositions left the viewer wanting more. The winning title sequence was then screened for attendees in the Paramount Theater. A Special Jury Recognition was also given to The Lego Movie’s end title sequence, designed by Brian Mah at Alma Mater for its ingenuity and labor-intensive Lego creations, culminating in an awesome cinematic experience. One final award, the Audience Award for Excellence in Title Design, was announced on Saturday. This award was chosen by members of the audience at the Title Design Finalists screening and the winner, once again, was Patrick Clair/Antibody/Elastic's main title work for the HBO series True Detective. So long and thanks for all the beers. It was wonderful to finally have the entire Art of the Title team together in Austin for SXSW and we’re looking forward to even greater involvement in next year's Design Awards. With luck, we'll see multiple events and panels celebrating title design in 2015! Make sure you join us.